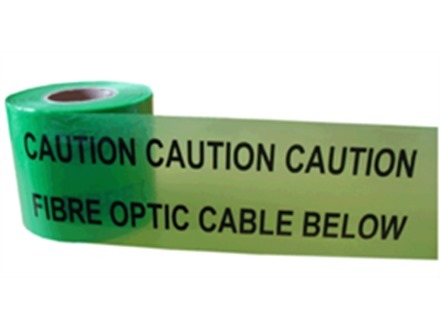 Home > Tapes & Floor Markers > Construction Site Tape > Electrical Warning Tape > Caution fibre optic cable below tape. Caution communications power cable below tape. Caution data cable below tape. Caution telephone cable below tape. 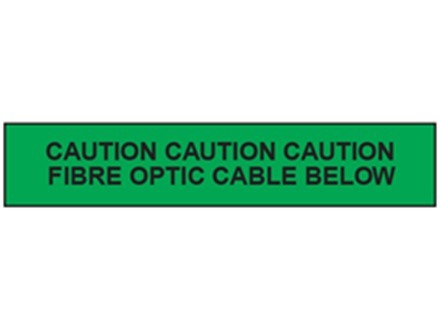 Caution fibre optic cable below tape. Part of our underground warning tape range, to show the location of these buried cables, to prevent damage leading to expensive repairs, and disruption to service. Underground warning tapes. Caution fibre optic cable below. Construction and utilities services tape for buried cables, cabling, pipes, pipework, mains, drains, sewers and ductwork. See NJUG (National Joint Utilities Group) guidelines for fixing location. UWT008 Size 150mm x 365m. Material polythene. (Virgin low density grade, 50 micron thickness containing no PVC).